We are happy to announce that all current faculty, staff, and students with a @udel.edu email address have access to Zoom Pro at no cost! If you have an existing Basic (free) Zoom account that you log in to with your @udel.edu email address, your account was migrated to UD’s enterprise Zoom Pro license. If you have an existing Zoom Pro account, you should have received a message from Zoom inviting you to move to the enterprise license. To request a new Zoom Pro account, please visit ​​udel.edu/zoom ​and click “Sign in.” On the UD CAS page, enter your UDelNet ID and password. Upon sign in you will be taken to your ​Profile​​ page. Zoom is UD’s centrally supported, easy-to-use desktop and mobile video conferencing platform that works with both MacOS and Windows platforms, and has free apps for Apple and Android devices. Zoom meetings can hold up to 200 participants each, coupled with screen sharing, annotation, white boards, breakout rooms, text chat, recording, telephone audio connections, and a number of other features. Want to get the most out of Zoom? Visit our Zoom Best Practices page to Zoom like a pro. Add-ons such as Large Meetings (200+), Webinars, Zoom Rooms, H.323 connections are available through the UD Enterprise license at a discounted rate. Sub-accounts and HIPAA compliant sub-accounts are also available. Learn more about sub-accounts and purchasing Zoom add-ons. Download our UDEL Zoom User Guide (PDF 322k) to get started. How does the host control a meeting? How do I set up polling? How do I set up break out rooms? Watch the recorded Zoom User Training and learn how to use meeting controls, features such as white boards, breakout rooms, text chat, and meeting recording, and more. Additional departmental training sessions can be requested as needed. You can also check out Zoom Live Online Training. If you have questions or need assistance with Zoom, contact the IT Support Center by email: consult@udel.edu, phone: 302-831-6000, or submit a Help Request. Is Zoom Pro free for UD students, faculty, and staff? Yes. There is no fee for Zoom Pro for UD students, faculty, and staff. What if I already have a Zoom account? All existing Basic and Pro Zoom accounts with a @udel.edu email address will be moved into the UD Enterprise license at no charge. You will receive a message from the University of Delaware letting you know about the migration in advance with more information. What if I paid for my Zoom account? If you paid through the current UD block of licenses, you will receive an email from Zoom (see example) requiring you to click a link to activate your account under the UD Enterprise Zoom Pro license. If you purchased your license using a UD Purpose Code, you will also be reimbursed for the remainder of your previous Zoom Pro license. This reimbursement will be processed automatically by UD Information Technologies via internal Journal Voucher. If you paid directly through Zoom, you will receive an email from Zoom (see example) requiring you to click a link to activate your account under the UD enterprise Zoom Pro license. This link will also allow you to choose a reimbursement option for the remainder of your previous Zoom Pro license. The reimbursement will be processed by Zoom. What will happen to my settings and password if I already have a Zoom account? Your settings will not change. However, after your Zoom account is migrated to the UD enterprise license, you will be able to log in to Zoom with your UD credentials. Simply click the Login with SSO option in the Zoom application, or login through the UD Zoom portal: www.udel.edu/zoom. If you used to log in to Zoom with a shared mailing list (e.g., dept@udel.edu), you will still be able to log in to your shared Zoom account with the same email and password in the Zoom application that you typically use (do not click the Login with SSO option), or login directly through the Zoom website: https://zoom.us/. What if I currently use a shared email address (like a mailing list / Google Groups) to log in to Zoom? What will happen to my Large Meeting Room, Webinar, or Zoom Room add-on? If you already have one of these add-on items it will transfer with your account to the UD Enterprise license. These items will still be paid add-ons to the Pro accounts, but they will be offered to you at a lower price through the UD Enterprise license. A sub-account with an assigned administrator will be created to manage the add-on for your users. How many meetings can I run on my account? The number of meetings and the length of meetings are unlimited, but only one meeting can run at a time through any given host account. How many people can connect to my meetings? The Pro Host account allows for up to 200 participants. Large meeting rooms and/or webinars can be purchased and added to a users account to allow for higher level of participants. Is Zoom secure / are the meetings encrypted? Zoom meetings can be encrypted with Advanced Encryption Standard (AES). HIPAA based compliance requirements are also available through the Enterprise solution at no extra cost. Although meetings can be HIPAA compliant, users are still responsible for compliance with regulations for sharing, storing and downloading recorded meetings. How do Zoom meetings work? The meeting host creates a meeting either through the Zoom app or by accessing their Zoom account through a web browser. By creating a meeting, Zoom will generate a link and phone numbers that meeting participants can use to access your meeting. Send the meeting connection information (phone numbers and URL) to your attendees. First time users are then asked to download and install a plug-in on their computers, which will automatically run each time they join a meeting in the future. How do I login to Zoom? Begin with Zoom by visiting https://www.udel.edu/zoom and clicking Sign in. Login with your UD credentials when you see the UD Central Authentication Service (CAS) screen. Click Login with SSO on the right-hand side of the application window. Can I use Zoom on my mobile phone or tablet? Yes, Zoom is available on Mac, Windows, Linux, Apple iOS, and Android devices. Download the free app from your respective device store. What system requirements does Zoom need? Zoom is available for Mac, Windows, Linux, Apple iOS, and Android devices. View the Zoom System Requirements page for details. Is Zoom web-based or do I need to download software? The preferred method is to download and use the Zoom application, which can be found on UDeploy. You can also access zoom from a web browser, by logging at https://www.udel.edu/zoom. Can I connect with people outside of UD using Zoom? Yes. You can invite anyone, inside or outside UD, to join your meetings. 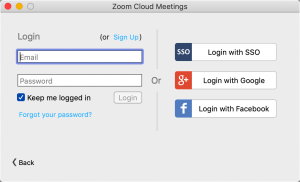 Users are not required to have a Zoom account to join a meeting; only the meeting host is required to have a Zoom account. Can faculty use Zoom to connect with students? Yes. Faculty are welcome to use Zoom to maintain an academic schedule in cases of illness, inclement weather, or to hold virtual office hours. Zoom is a great way to help students and faculty stay connected. You can contact your faculty member to inquire about their use of Zoom. Can I share my screen during a Zoom meeting? Yes, Zoom does feature screen sharing as well as a shared whiteboard, text chat, file transfer area, and breakout groups.